N.B. I am not responsible for offering this course during the Fall 2016 semester. The exams will mostly concentrate on higher levels of interpretation of the lecture material, such as comparisons and contrasting, as well as interpretations, analysis and synthesis, rather than listings of terms or regurgitation of facts. Please see the Undergraduate Guide to Success for more information on what to expect in order to perform optimally on one of my exams. See below for more information on the Essay and Presentations. Herrera, C.M. and O. Pellmyr. 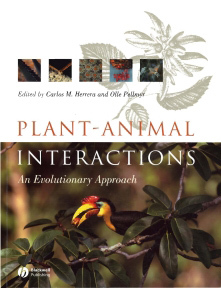 Plant-Animal Interactions, An Evolutionary Approach. Blackwell Publishing. Copies are available at the University bookstore, Agora and a number of online locations. The readings from this text are required for this course although some lecture material will come from elsewhere, particularly from the primary literature. The goal of providing these notes is to allow students some relief from note-taking and permitting them to listen to and to better integrate the lecture material. The slides notes are NOT complete, however, and students will be required to attend lectures and read the textbook in order to fill in the missing information. Usually, the information contained on the slides relates to higher levels of organization in the learning process (context and interpretation), as opposed to simply learning lists and names. Additionally, I have provided lists of the Keywords of importance to the field of Plant-Animal Interactions. You will be expected to understand and to be able to use each term of importance during your oral and written communications on these subjects. Additionally, you may hopefully find the keyword lists to be useful during your studies to build concept maps to help you conceptualize the relationships during your studies, or simply to help you reconstruct the narrative surrounding the various case studies and principles we will be looking at over the term together. You will write a 5-page essay on the ecological and evolutionary context of a plant-animal interaction that interests you (double-spaced, 12pt font, no title page, including references, with any tables and figures as optional addenda, although they should not be necessary nor are they recommended). This writing assignment is meant to be brief on the natural history component of your topic and to delve deeply into a specialized and technical form of literature review and scientific communication on the current state of research. 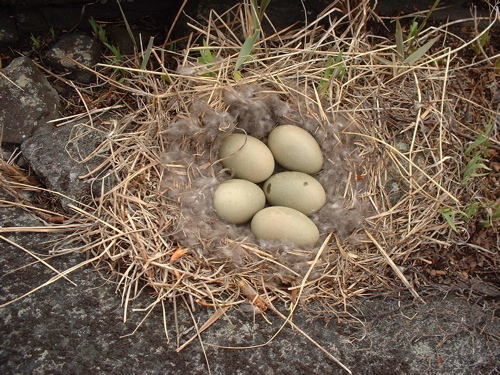 Furthermore, you are expected to focus the essay on the impact of your chosen interaction on an ecological and evolutionary outcome or consequence, as it relates to one of many themes in the course (such as speciation and the evolution and maintenance of biodiversity, generalized vs. specialized interactions, mutualistic vs. antagonistic associations, biochemical and phytochemical mediations of interactions, ecosystem engineering, or arms-race and leap-frog evolution, as examples). References coming only from the primary literature will be permitted in the bibliography. Please see the Undergraduate Guide to Success for more information on how to write a stellar scientific essay. If you do not have a hard copy of the Student Guide, you may view the chapter on Essays here. Please make sure that you familiarize yourself with the uOttawa guidelines on avoiding plagiarism (found here) in order to ensure that your work is original and does not constitute academic fraud. You will have to verify your essay topic with me by October 9, 2015 at the latest (10% penalty on essay grade otherwise), justified by at least two primary research articles published on the subject by different researchers. All students are strongly advised to meet informally with me by early November to go over the essay subject matter, content and structure. The final copy of the essay (in both electronic and paper formats) is due one week after the last day of classes (December 16th and there will be a 10% penalty per day on the essay grade if late) in order to allow you to incorporate additions or modifications based on questions or comments that may arise after the presentation (see below). The last portion of this course will be devoted to student presentations on the information contained in their essays. You will be assigned by me into groups of 2 students based on commonalities between your respective essay topics and your assignment will be to work together to prepare a cohesive presentation, drawing from both of your research essays. You will pick up where we left off in class and delve further in detail into case studies as they relate to the themes of the course (diversification, generalization vs. specialization, fitness effects etc.). These presentations will be given in the format of university lectures (not repeating what we will have already learned in the course to date) and will be of a duration of 15 minutes (plus time for questions). You are highly advised to consult with me during the construction of your presentation on its structure and content. Please see the Undergraduate Guide to Success for more information on how to give effective scientific presentations. If you wish only to consult the section on presentations, you can find the DOs and DON’Ts section here. Students will be marked both by the class and the professor (weighted 40-60%, respectively), therefore attendance is mandatory and you will lose up to 10% of your mark for your own presentation by being absent during the others. I have reserved the last 4-5 lecture sessions in order to run the student presentations. Please note that your essay may be marked partly on your ability to address questions that may have been raised during the presentation and to integrate them into its narrative (if applicable). In some ways, you may consider the presentation as a ‘trial run’ to see how cohesive and comprehensive your topic thesis is. The presentation schedule is as follows. You will need to submit a pdf and a copy of your powerpoint file on the first day of the student presentations, which will not be modified after that date, even if you are presenting on a later date. This means that all talks must be ready to go on the first day of presentations! The evaluation form that we will be using the grade the group presentations can be found here in .pdf format. Please refer to it in order to familarize yourself with the grading expectations. Also, as you are going to be evaluating the presentations of your colleagues, you may print out copies for your own in-class evaluations (otherwise I will have some on-hand). You will submit your evaluation of your colleague’s presentations on paper at the end of the class. The information presented was phenomenal and unlike any other class I have ever taken. The professor was excellent, funny, friendly, knowledgeable. I loved the evaluation format Essay + presentations were fun! Definitely keep this course! AWESOME! Always have loved your classes. I’m really enjoying this course so far. The material is fascinating and your passion for the subject matter really shines through! Thank you! Enjoying the communication aspect of this class which is underrated in many other courses. Prof is very enthusiastic, this makes coming to class enjoyable. If it wasn’t at 8h30 in the morning, I would bring friends to the class so they can appreciate it as much as I do. I liked having a paper to write and a presentation. The course well organized and well presented. I think it should be kept in as a regularly available course. Adam Brown’s course website was very effective teaching tool. He was always available to discuss course matter, a dynamic professor. Having no final exam was nice. Very engaging teaching style – Good to do a paper and seminar on the same topic – more time for in-depth research. Very interesting course material. Very closely followed the text book which was helpful. Overall a good course with a lot of potential. Good teacher, keep it up! Should offer this class again. Overall I really enjoyed this class. The class is a very well more organized. Good choice of book! Good job, well organized and stimulating and aesthetically pleasing slides. I enjoyed the always excavation of facts and that it gave a great idea of how these intricate systems work. – I liked the lecture style and the exam style. – Great organization and combination of fields. Interesting material, focus on evolutionary aspects. Professor Brown is an excellent teacher and portrays the info effectively. I would recommend this course to any of my friends. Excellent course overall. Quantity of material was ideal. Well presented. Really enjoyed case studies and guest lectures. Good course material and course sequence. Great marking scheme and evaluation process (2 midterms, presentation and essay). Dr. Brown is organized and energetic, he makes class entertaining.